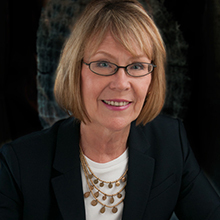 Margaret Leinen, a highly distinguished national leader and oceanographer, was appointed the eleventh director of Scripps Institution of Oceanography at UC San Diego in July 2013. She also serves as UC San Diego’s vice chancellor for marine sciences and dean of the School of Marine Sciences. She joined UC San Diego in October 2013. Leinen is an award-winning oceanographer and an accomplished executive with extensive national and international experience in ocean science, global climate and environmental issues, federal research administration, and non-profit startups. She is a researcher in paleo-oceanography and paleo-climatology. Her work focuses on ocean sediments and their relationship to global biogeochemical cycles and the history of Earth’s ocean and climate. Leinen leads UC San Diego’s ocean, earth, and atmospheric sciences research and education programs at Scripps Oceanography, the foremost environmental research institution that addresses the most pressing environmental problems facing our planet, provides the knowledge necessary to address these challenges, and teaches the next generation of science leaders. Leinen enhances Scripps and UC San Diego through her impressive academic and administrative career. Prior to joining Scripps, she served as Vice Provost for Marine and Environmental Initiatives and Executive Director of Harbor Branch Oceanographic Institute, a unit of Florida Atlantic University. Prior to that she served for seven years at the National Science Foundation (NSF) as Assistant Director for Geosciences and Coordinator of Environmental Research and Education. She oversaw a budget of $700 million, led government-wide planning for climate research, and co-led government planning for ocean research. While at NSF, she presided over and directly influenced some of the most consequential programs in marine, atmospheric, and earth science. She is the founder and served as president of the Climate Response Fund, a non-profit organization that works to foster discussion of climate engineering research and to decrease the risk that these techniques might be called on or deployed before they are adequately understood and regulated. Previously, she spent two years as the chief science officer of Climos, Inc., a startup focused on green technology for climate mitigation. Leinen has also served in other academic leadership positions. At the University of Rhode Island, she was Vice Provost for Marine and Environmental Programs and Dean of the Graduate School of Oceanography. She is President of the American Geophysical Union, past chair of the Atmospheric and Hydrospheric Science Section of the American Academy for the Advancement of Science, and past president of The Oceanography Society. She serves on the board of the National Council for Science and the Environment and previously served on the National Ecological Observatory Network (NEON). She also served as vice chair of the International Geosphere-Biosphere Programme and on the board on Global Change of the National Research Council/National Academy of Sciences. She is vice chair of the Research Board of the $500 million Gulf of Mexico Research Initiative. She is a Fellow of the American Association for the Advancement of Science, a Fellow of the Geological Society of America, and has been awarded Distinguished Alumni Awards from all three universities she attended as a student, University of Illinois, Oregon State University, and University of Rhode Island. She received her doctorate in oceanography from the University of Rhode Island (1980), her master’s degree in geological oceanography from Oregon State University (1975), and her bachelor’s degree in geology from the University of Illinois (1969).